I have created a simple package that allows the use of Cache with the Laravel Framework. From my initial testing everything seems to be operating smoothly but I would like to appeal to the PHP users in the community to help me improve this package. I have a rights problem when giving a user permission to perform some select queries on particular tables. So I have created a user with the following rights. So this all works well. No problem so far. But the customer is using a program where you can easily build visually the query by selecting the table, choose the right colums etc. So the problem we have is when I give the user the Role %All the tables are shown. And the user is allowed to query all tables. But we only need to see the granted tables granted, so role %All is not valid but is the only Role, Permission I have tried so far that shows the table information correctly. So what do I need to do for only showing table information (schema information) for the granted tables. I got a quick answer from this forum yesterday so I'm going to try my luck again today! I've hit an error in another table when trying to extract through the Cache ODBC driver, but this one gives me less details and I'm struggling to pinpoint what might be causing the error. The table I am trying to extract is called REF_TABLE_ONE. 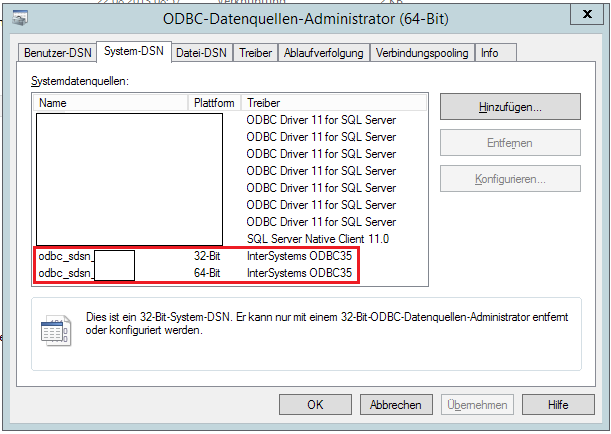 I'm writing to an ODBC connection to a SQLserver database, and I seem to be sending the wrong data type to a date colum? I'm working on exporting data from an Intersystems Cache database through the Cache ODBC Driver. There is a particular table that is giving me an error message. The ODBC Driver crashes and reports an error from the Cache system. I think I was able to trace down where the error is coming from, but I do not know how to debug or fix the error. The table I am trying to extract is called SEDMIHP. I was able to open up Cache Management Studio and find the class that matched up with the table name. I should mention that this is my very first time working with Intersystems Cache, so I apologize if I'm sounding dumb or inexperienced here. I'm working on my first SQL service using the SQL inbound adaptor, and I'm having trouble. Would anyone be kind enough to share a working example? Hoping someone can help with this odd error. A vbscript file is being used to perform an update to cache. The file has worked without an issue for well over a year. Recently, the update has begun to throw an error. Notice that the query is attempting to update COLUMN1 which is a free text column. Most of my classes are mapped from Globals. I want to access Cache classes from a BI software through ODBC connection. 'Last update' information does not exist in most of the classes. My question is whether there is a 'last update' timestamp that is automatically generated for each line in classes I can extract to external systems? I have been trying to pull data through a linked server in SSMS from an InterSystem Cache Database for a while, this is to enable us to join the data to other source systems in our Data Warehouse. I have set up an ODBC connection and a linked server to the database and can execute queries through OPENQUERY in Management studio, but the data is huge (> 100million rows). So when I execute a SQL query with a WHERE clause the query just spins. If I SELECT TOP 100 with no where clause the query returns data, so I know that all the connections are correct. Any guidance would be greatly appreciated! class Ens.Queue visible to ODBC? I would like to make the EnsQueue class visible to the Intersystems ODBC client. It appears it must be included in the SQL-visible classes first. Problem is, what .so do I use?? "Listen" to a cache db? Im just wondering if there is any possibility to "Listen" to a cache DB? We have our cache DB somewhere else provided by a different company, we are provided the interface to connect to that cache DB so we can extract the cache DB every night. Im just curious if theres a way to "listen" to the cache DB, so if theres any changes on the table in the cache DB, I could make a trigger to extract the table again. I know i could just set my ETL every hour or so... but that would extract all the tables in cache DB. Thanks a lot for any help and information. I want to know if there is any possible way to use the same query for different ODBC schemas. 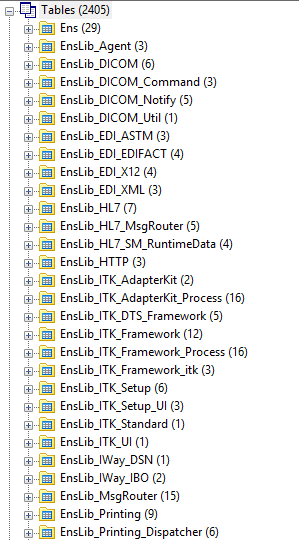 I am trying to built a SSIS package thru BIDS Visual Studio 2013. My Datasource is a InterSystems Cache Database, I wanted to Import Tables records from the Datasource to MS SQL Server 2014. As a Sanity check. I only created one Package to import one Table to MSSQL Server to try out. The connection to the InterSystems Cache Database was successful. The DSN for the InterSystems Cache Database is created in the System for 32 and 64 Bit. I have generated a class using the linked procedure wizard however I can't get it to work if the datatype of one of the parameters is VARCHAR(MAX). It works fine if I change it to say VARCHAR(500) and rerun the stored procedure wizard. Can anyone see what I am doing wrong? I think it is to do with the way I am using the %Stream.GlobalCharacter? Any help is much appreciated. Would anyone recommend techniques on how to limit the amount of calls that external groups are making to our resources? Recently we had an issue where one of our ODBC accounts maxed out the license to one of our DB servers (50 max). This is a sample Ensemble/Health Connect production which demonstrates how to receive an HL7 order (ORM) inbound from a file, extract fields (in this case, basic demographic information), and insert those into a table in an external SQL database via ODBC. I am tasked with using CACHE to insert data retrieved from a CACHE data base and insert it into an sql database. The columns in the sql table that I am trying to insert data into have names that contain underscores such as "ACCESSION_DATE" I found a utility in CACHE to connect to the sql data base and perform inserts. I have the data I need to insert. I need to pass the data into the sql utility referencing the column names. I tried using indirection to set the data into underscored variables, but that isn't allowed in cache object script. Anyone have suggestions as to how to do that? I am new in Cache. I have to update a record with a long text field, for that, I am using ODBC but the issue is that it is returning an error when I execute the ODBC SQL statement because the field contains some commas, colon, double quotes, single quotes, and CR LF characters. There is a way to escape this chars? I have seen I can save the field when I replace the single quotes with a double single quote (it's -> it''s) but I can not save the information when the field contains double quote chars. What about the other chars? Any Ideas? Than you in advance. I have a service that that I would like to use to poll the database table in MySQL server 2012 and get an id to use if the condition is met but have trouble achieving this here is what I have so far any suggestions please. Ensemble SQL Gateway failed error & StayConnected setting ? Hi, I am trying to execute a store procedure within an ensemble operation to connect to aMsSQL database and I am having problem to pass the input arguments... I have tried several things but only one seems to work and it is not the ideal solution. I am fairly new to Ensemble development. I was wondering what is the best process of returning the resultset from a SQL outbound adapter to the BPL that had invoked it. DSN does not show up on InterSystems Ensemble SQL Gateway configuration. I am running InterSystems Ensemble 2016.2 on ubuntu and trying to connect to a remote MS SQL server database. Http response incomplete when attemting to set up ODBC connection on Ensemble. We are trying to make an ODBC connection via our intersystems ensemble (2016.2 running on ubuntu). However, when I am testing the connection I receive a pop-up that: "Http object response incomplete or invalid.0,#R". Note that the iodbctrace.log remains empty (and it is working because on the first try it registered a 459 error that I should activate kerberos, which I did). Any advise where I should look?